Shiga Prefecture finally has a true and full-fledged “antenna shop” in Tokyo named “CocoShiga” (ここ滋賀). 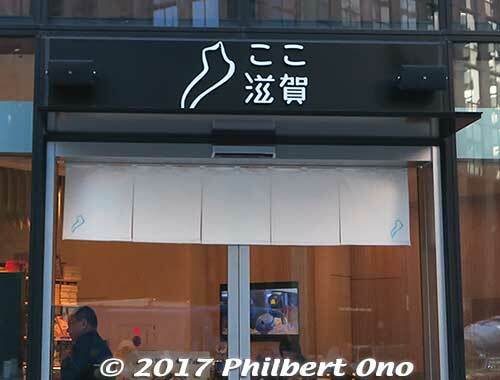 It opened on October 29, 2017 in the Nihonbashi district. 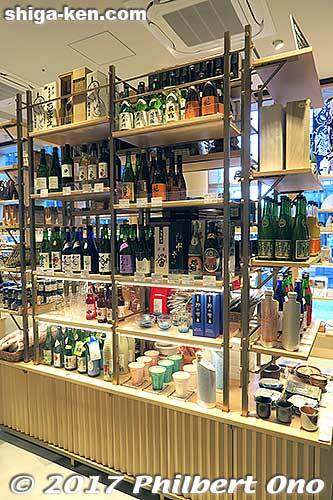 People in Tokyo can now buy food, sake, crafts, and souvenirs from Shiga more than ever before. We can also have a drink at the bar and dine at the small, upscale restaurant upstairs. CocoShiga is in its own little building on a corner of the main Nihonbashi intersection (Chuo-dori and Eitai-dori roads). 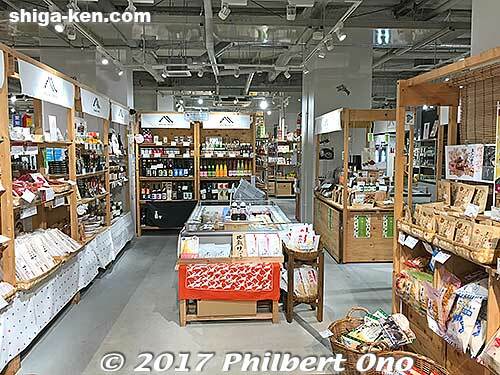 The first floor has a shop named “Market” (open 10 a.m. to 8 p.m.) selling about 1,000 different Shiga products (mostly food and sake from 33 sake breweries), a bar (strangely named “Shiga’s Bar“) where you can try Shiga sake 10 a.m.–11 p.m., and tourist pamphlets from Shiga. The floor space is not huge, but big enough. 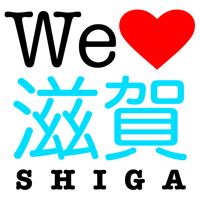 The 1,000 Shiga products are labeled in Japanese with little pieces of cardboard, but I’m afraid that if you don’t know Shiga, it might be difficult to figure out which products are Shiga’s most popular or famous. The store does not really highlight particular products. So just to let you know, Shiga’s most famous food is funazushi fermented carp (get the female nigorobuna fish), Omi beef (wagyu), Biwa salmon, red konnyaku (devil’s tongue), Omi tea (from Tsuchiyama), and Omi rice. 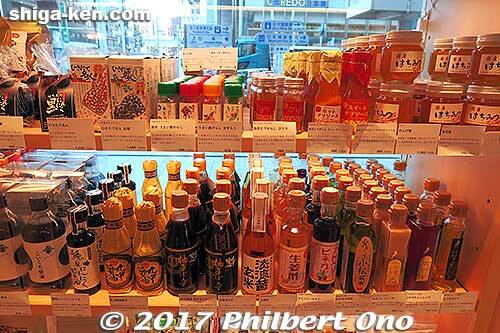 Note that CocoShiga does not sell all the famous food and products that Shiga has to offer. For example, the famous confections from Taneya and Club Harie are missing. 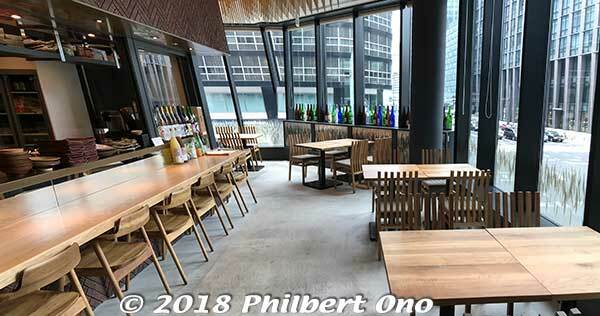 The second floor is an upscale restaurant named “Nihonbashi Jinomi” open for lunch (11:30 a.m.–2:00 p.m.) and dinner (6 p.m.–11 p.m.). It serves Lake Biwa fish like funazushi (fermented Lake Biwa carp) and Biwa salmon as well as Omi beef. Dinner courses cost ¥5,000 and ¥8,500. The third floor is an open-roof Terrace with parasol tables. CocoShiga is open every day of the year except Dec. 31 to Jan. 3. CocoShiga’s 1st floor shop also converts into an event space. Funazushi fermented carp and shijimi clams in the refrigerator. Shiga’s Bar for mainly sake. Good variety of sake from Shiga. Jinomi restaurant on 2nd floor. 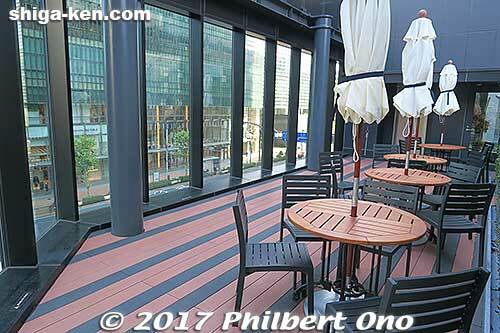 Open-roof Terrace on the 3rd floor where you can consume what you purchased. It might be too cold in winter and too hot in summer though. Nihonbashi has historically been Tokyo’s district for textile wholesalers and trading companies. Shiga has had close ties with Nihonbashi ever since Omi shonin merchants from Shiga opened shop here during the Edo Period to sell fabrics made in Shiga. The most famous Shiga clothing store in Nihonbashi was Shirokiya (白木屋) opened by Nagahama-born Omura Hikotaro I (大村 彦太郎) in 1662 on the site across the street from CocoShiga. 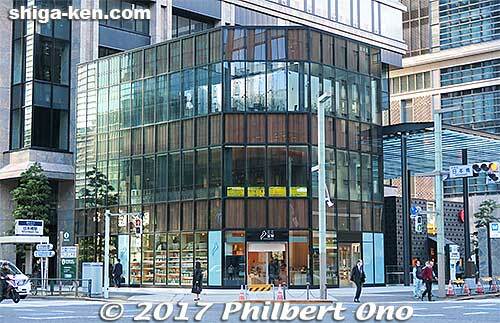 (This was even before the Mitsui family opened the store that would become Mitsukoshi Dept. Store in Nihonbashi.) It was absorbed by Tokyu Dept. Store in 1958 which eventually closed this flagship store in 1999 where the huge COREDO Nihonbashi shopping complex took its place. Although sadly Shirokiya no longer exists in Japan (only an offshoot store in Honolulu, Hawaii remains), Nihonbashi still has a good number of businesses (mainly fabric wholesalers) originally from Shiga. Shiga Bank’s Tokyo branch and the Tokyo Shiga Kenjinkai building are in Nihonbashi. Itochu’s Tokyo office was also in Nihonbashi for many years before it moved away. So for Shiga, I agree that Nihonbashi is the ideal Tokyo location for CocoShiga. 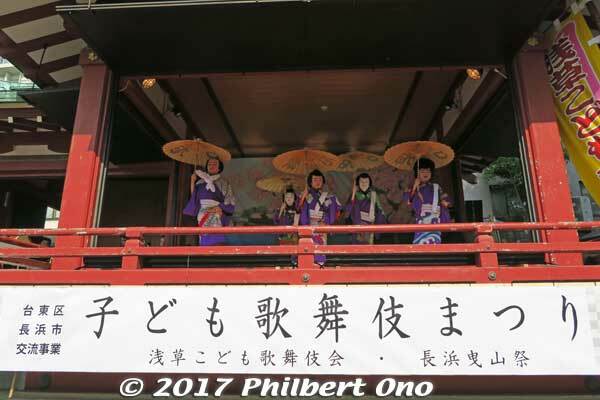 Of course, Nihonbashi is most famous for its namesake Nihonbashi Bridge which was the starting point of the old Tokaido Road and Nakasendo Road both of which go through Shiga before reaching Kyoto. Nihonbashi thus became Japan’s most famous bridge (originally a wooden bridge) and Nihonbashi was destined to become one of Japan’s most famous places. The bridge is a very short walk from CocoShiga. In the old days, the road in front of CocoShiga went directly to Shiga along the Tokaido Road. Needless to say, Nihonbashi is a high-rent district and CocoShiga is sitting on one of Tokyo’s prime locations next to a subway station. CocoShiga’s rent has been reported to be a whopping ¥8.6 million per month. That’s about ¥286,666 per day, not including personnel costs. CocoShiga is a five-year project by Shiga Prefecture which is investing over ¥1.3 billion. In return, they are expecting ¥252 million worth of PR and inbound tourism to Shiga during the five years. Shiga is finally shooting for the big time with CocoShiga. I don’t know what’s going to happen after five years though. Whether they will renew the lease or move or shut down. For now, please help Shiga recoup its investment by buying stuff from CocoShiga whenever you’re in town. CocoShiga is a huge leap over its previous incarnation called “Yume Plaza Shiga” (“yume” means “dream”) in Yurakucho. Yume Plaza was Shiga’s tourist information office and small gift shop in the Tokyo Kotsu Kaikan building next to Yurakucho Station (one stop from Tokyo Station). This large office building still has a few other antenna shops like from Hokkaido, Akita, and Nagano Prefectures. The problem was, Shiga’s Yume Plaza was on the second floor where there was little foot traffic. 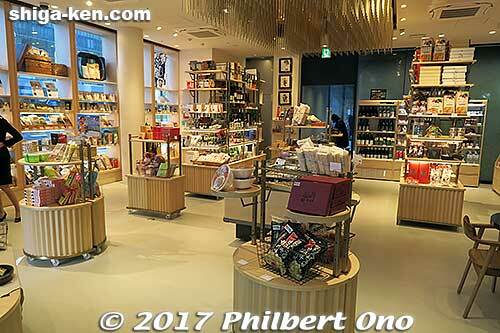 Meanwhile, Hokkaido’s large Dosanko store on the ground floor facing the main road and Yurakucho Station was always packed with people. The ground floor saw heavy foot traffic while few customers bothered to go upstairs. The Yume Plaza antenna shop was just a small room where they sold a few trinkets and non-perishable food. It was more a tourist information office than a shop. I never took my friends there. It was too embarrassing. Also, for many years, they were closed on weekends just when people in Tokyo have free time to go shopping or plan trips. It certainly didn’t make sense to be closed on weekends. But they later managed to stay open on weekends. The atmosphere was lax and the former Biwako Visitors Bureau Tokyo Office Manager (Ito Masahiro, 60, 伊藤雅博) who worked there was charged in July 2017 with falsifying & pocketing ¥1.24 million in travel expenses. Such shocking news. Shiga section that was in Chabara. We were all well aware of Shiga’s Yume Plaza shortcomings. But we got some relief in Sept. 2015 when a small mall called “Chabara” (Nippon Hyakkaten Shokuhinkan) under the train tracks next to Akihabara Station opened. 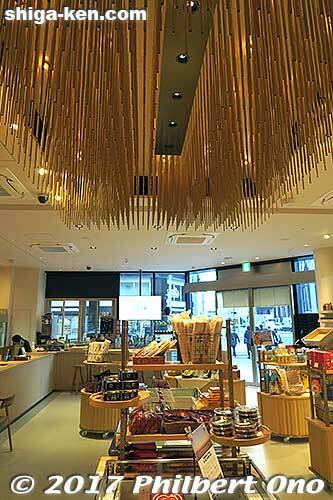 Chabara is a store with shelf space for many prefectures including Shiga. People in Tokyo could finally buy funazushi, Omi beef, sake, Omi rice, confections, and more year-round. Update: For a time, the Shiga section in Chabara overlapped with products found in CocoShiga. By Oct. 2018, the Shiga section in Chabara has been discontinued. Then on March 21, 2016, Nagahama boldly opened its own little museum in Ueno, Tokyo called “Biwako Nagahama Kannon House” (びわ湖長浜 KANNON HOUSE). It exhibits one precious kannon Buddha statue (Goddess of Mercy) brought over from Nagahama which has many kannon statues and temples. Small and beautiful museum to connect with Shiga culture, but they don’t sell Nagahama merchandise. One thing CocoShiga is missing is an exhibition space. When it was announced that Shiga was planning to open a large antenna shop in Nihonbashi, it was very exciting news. It was hard to believe, after all these years of obscurity when other prefectures were already operating high-traffic antenna shops in prime locations in Tokyo. Shiga’s dinky and barren outpost in Tokyo lagged so far behind. Now it has leapfrogged to Nihonbashi. CocoShiga logo above the front entrance. On the left is the shape of Lake Biwa. English signage is hidden at the bottom. Poorly designed. “CocoShiga” (ここ滋賀) literally means “Here’s Shiga” and has nothing to do with hot chocolate (cocoa) or coconuts. Although in Japanese it’s short and easy to remember, it’s not very original and not easily understandable by foreign tourists whom CocoShiga is also targeting (think 2020 Tokyo Olympics). The Japanese word “Coco” (koko ここ) meaning “here” has become a popular prefix in business names. In Shiga, we already have Kokocool (online shop in Shiga) and Kocopia (roadside station in Konan). Outside Shiga, there is kokoka (Kyoto International Community House), Coco Miyagi (Miyagi Prefecture’s antenna shop in Tokyo), and Nagoya-based convenience store chain Cocostore before it was recently bought out by a rival chain. Perhaps the most famous “Coco” in Japan is the Coco Ichibanya curry restaurant chain (eight branches in Shiga). So please Shiga, let’s not have any more “Coco” names. It’s like “Yume” (dream), “Dream,” “Rainbow,” and “something-pia” (as in Utopia) which are popular and unoriginal names across Japan as well. Other problematic English names are “Shiga’s Bar,” Shiga’s Concierge,” and “Shiga’s Guide” in CocoShiga. CocoShiga’s bar, concierge, and guide do not belong to any person named “Shiga.” They are just a mistranslation of the Japanese. In English, it came out as a possessive which does not reflect the intended meaning. Their monthly magazine “Shiga’s Guide” has columns named “Shiga’s People,” “Shiga’s Map,” “The Shiga’s Story,” and “Shiga’s Trip Guide” recommending what you can do on “Days 1” and “Days 2.” Somebody really loves the apostrophe “s”. (But why no “Shiga’s Market” and “Shiga’s Restaurant”?) Oh well, so much for correct English in Shiga. Let’s hope the English-learning kids won’t pick it up. Preparing rice balls made of Omi rice at Shiga’s Bar. 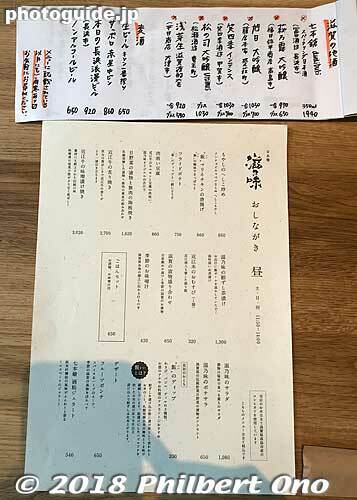 The 2nd floor Jinomi restaurant menu is in Japanese only. Hard to read the small text. Wish they had pictures of the food. 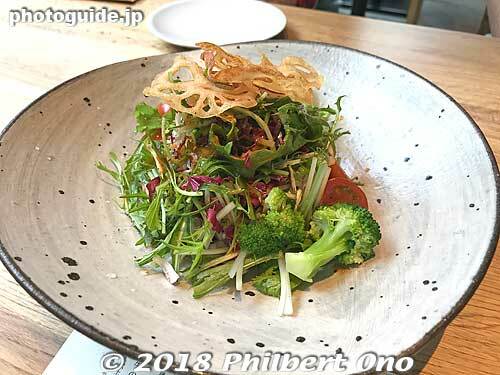 Jinomi restaurant’s vegetable salad. Most dishes are served on Shigaraki pottery. Shiga tourist brochures (no English) at CocoShiga. As you may have guessed by now, antenna shops in Japan do not sell antennas. 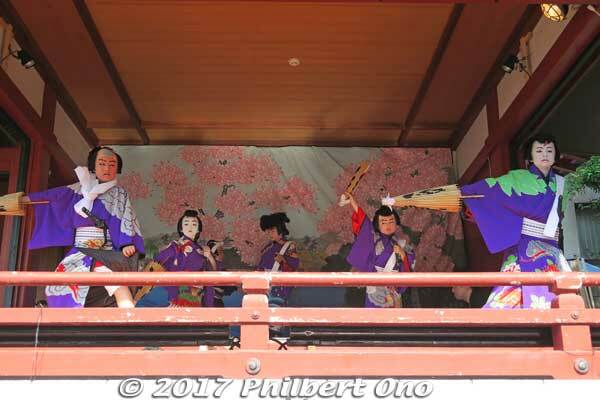 They sell food, crafts, and souvenirs from a prefecture, municipality, or company. 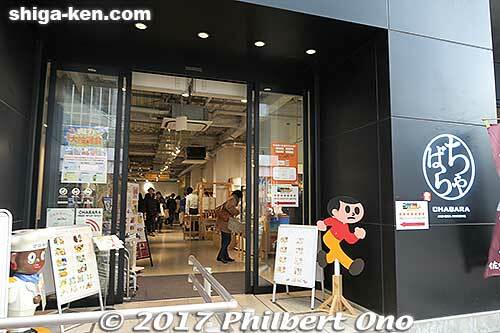 Prefectural antenna shops also provide tourist information and may include a restaurant. Many Japanese prefectures have an antenna shop in central Tokyo to promote their products (mainly food) and inbound tourism. They supposed to be feelers (like insect antennae) or feedback shops to gauge what products are popular. 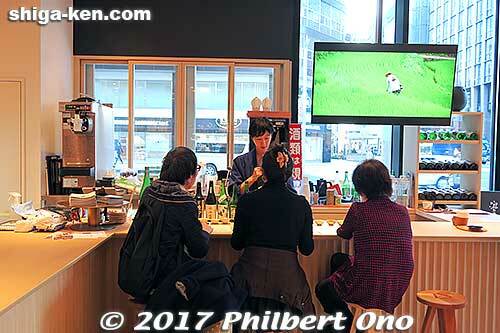 Prefectural antenna shops are an outgrowth of prefectural tourist information offices in Tokyo. Once upon a time, most of the prefectural tourist information offices were conveniently concentrated in a building right next to Tokyo Station. 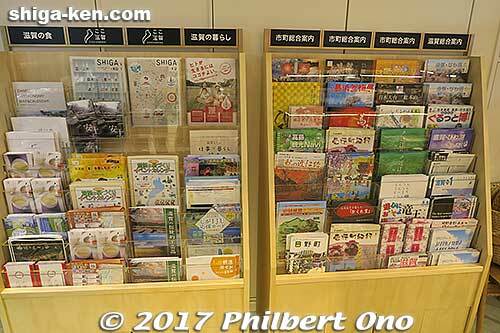 This made it easy to pick up tourist brochures before hopping on your train to the prefecture. 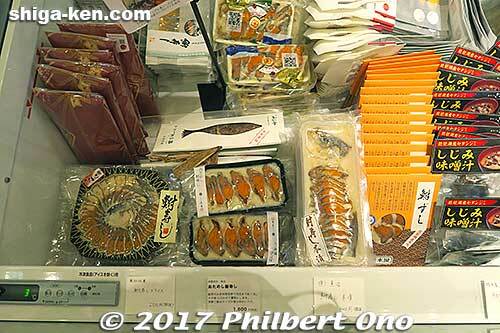 Some of them, like Okinawa’s huge Washita Shop in Ginza, had enough space to sell their prefectural products. However, the convenient building next to Tokyo Station (Yaesu side) that housed these prefectural tourist information offices was eventually torn down as part of the station’s redevelopment. Those prefectural tourist information offices moved out and scattered around in Tokyo. Many remained near Tokyo Station and Yurakucho Station (especially inside the Tokyo Kotsu Kaikan building which also housed the Japan National Tourist Organization). 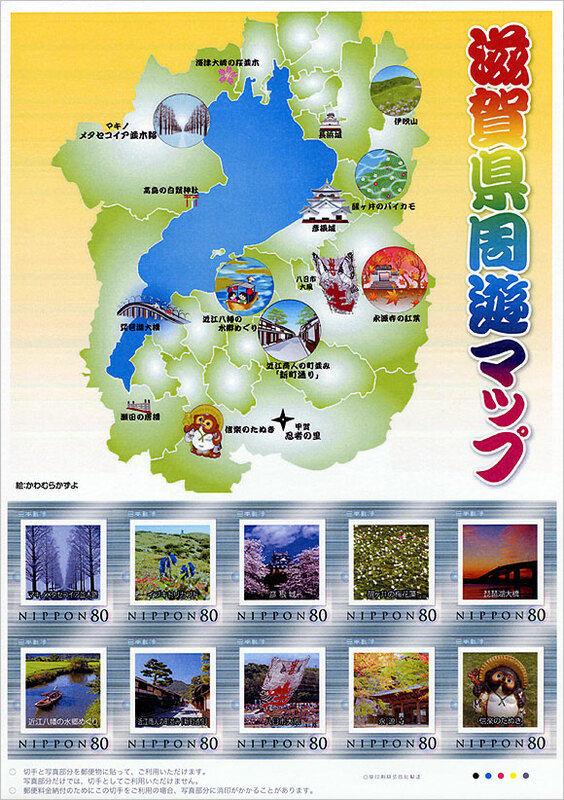 It then became quite inconvenient to pick up tourist brochures from multiple prefectures, but the Internet changed all that when much tourist information went online. So now, having a shop to sell physical goods (especially food) became more important than having a tourist information office for the public. Reed decoration on the 1st floor ceiling. Have to look closely to see what’s what. Even with Chabara and CocoShiga or any store selling Shiga merchandise, they can never stock everything that Shiga has to offer. Even though CocoShiga’s 1,000 different products sounds impressive, they still don’t have things that I want to buy (mainly as gifts for friends). Like the hilarious “Koka Cola” from Koka (I hope it’s not a trademark infringement), Funazushi Pie cookies from Moriyama, more Adoberry confections from Takashima, Omi-jofu fabrics, more Shigaraki ware, and Lake Biwa pearls. The shop is not big enough to have everything. As of this writing, it’s too bad nothing is in English. You would think that with an investment of over 1,300,000,000 yen on the rent alone, they would have some money for foreign language translations in Japan’s most international city. But apparently not. Shiga businesses who want to sell their products at CocoShiga have to undergo a product screening. Not all businesses applied to sell at CocoShiga and not all products passed the screening. So we only see a small sample of Shiga products. But CocoShiga plans to change or rotate the product lineup every season so we may see more different products later. CocoShiga is being managed by Tokyo-based company UDS Ltd. They have a branch office in Omi-Hachiman and have experience in the hospitality industry, managing a few hotels and restaurants. They seem to be well-qualified to run CocoShiga, but the staff are not from Shiga. The General Manager is from Okinawa. Being newbies to Shiga, the staff visited Shiga multiple times over a year to learn about the products CocoShiga would be selling. There are positive things about hiring outsiders since they can perceive things Shiga people might not be able to. But you can’t talk to them about home in Shiga, like at the bar while drinking or in the restaurant. For Shiga travel inquiries (“Concierge”), I believe they have staff from Shiga in the back office. 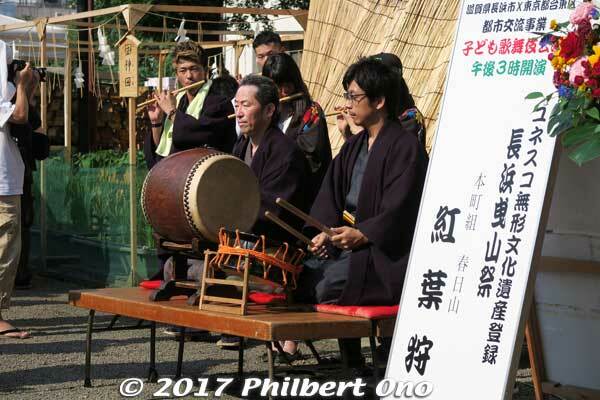 CocoShiga had a grand opening on Oct. 29, 2017 just when a typhoon hit Tokyo. The tape-cutting was done by Shiga Governor Mikazuki, noted journalist Tahara Soichiro from Hikone, and pop singer Nishikawa Takanori (T.M.Revolution) who is from Yasu and a Shiga tourism ambassador. Hiko-nyan was there too. About 2,300 customers came on the opening day, lining up in the rain. Many had to wait two hours to get in. 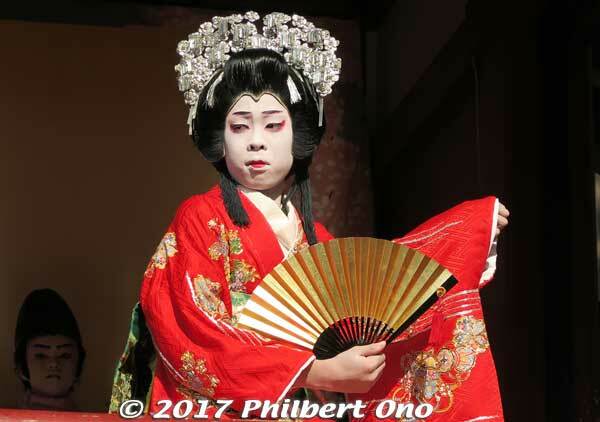 In mid-Dec. 2017, CocoShiga announced that they saw 100,000 customers after a little over a month in business. That’s about 2,300 customers a day. So far, so good (except for the English). Update: CocoShiga announced that they saw 530,000 customers by Oct. 10, 2018. This was ahead of their projection that expected this number by the end of Dec. 2018. 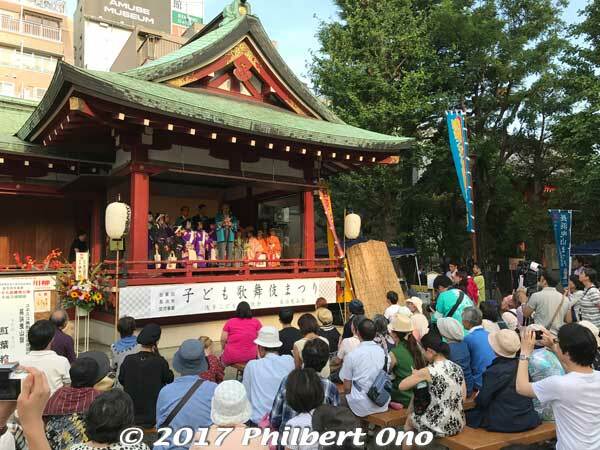 It was a special event to mark Nagahama Hikiyama Matsuri as a UNESCO Intangible Cultural Heritage of Humanity as one of 33 “Yama, Hoko, and Yatai float festivals in Japan” in Dec. 2016. It is not an annual event. 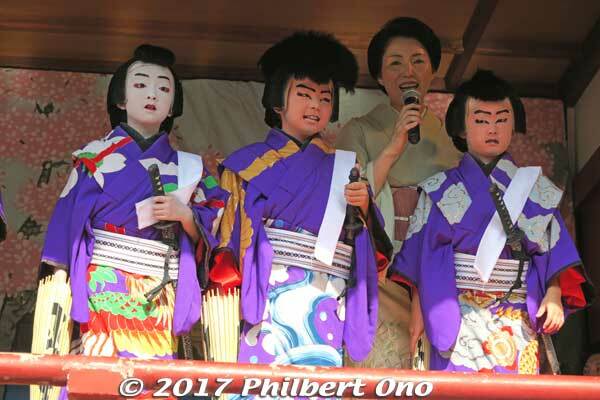 Two child kabuki troupes performed from 3 pm. 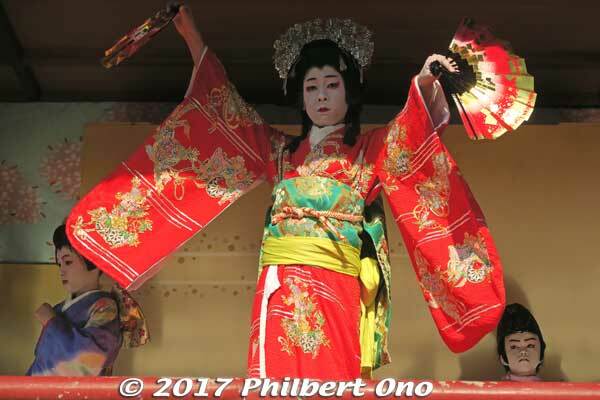 First one was the Asakusa Child Kabuki Troupe (浅草こども歌舞伎会) who performed a well-known play called “Shiranami Go’nin Otoko” (白浪五人男) about five thieves. 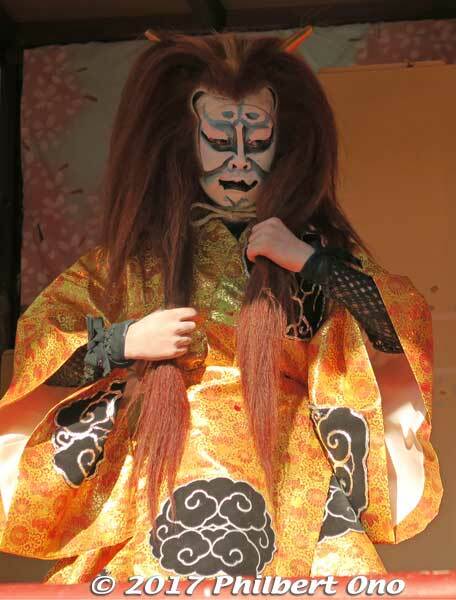 I never knew Asakusa had a child kabuki troupe. Never saw them perform. At the end of the play, the kids were introduced one by one. 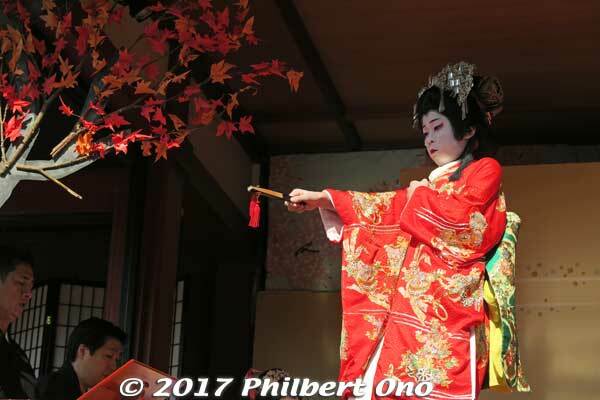 The second play was performed by a child kabuki group from Nagahama Hikiyama Matsuri’s Kasuga-zan float (春日山) in Shiga Prefecture. It started with festival music. 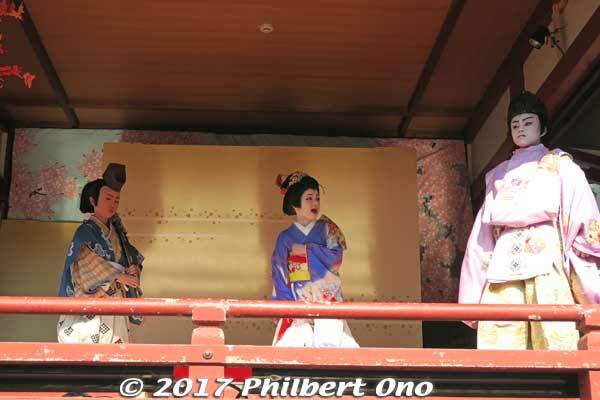 They performed a famous kabuki play called “Momiji-gari” (紅葉狩). 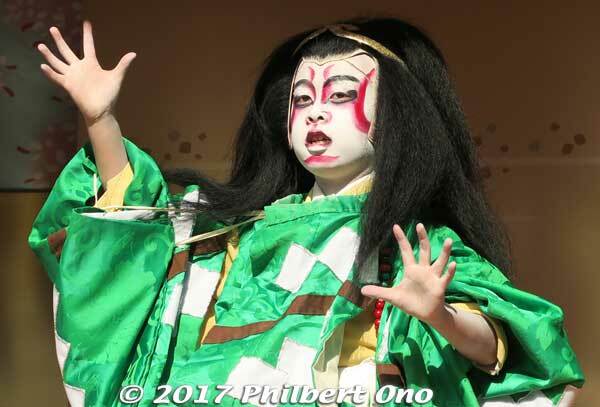 All the child kabuki actors are boys, age 4 to 12 (no girls, in accordance with tradition). 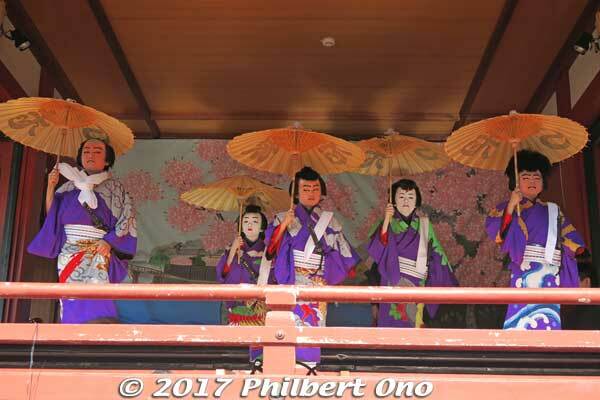 They normally perform on an ornate wooden float at their float festival held in mid-April in Nagahama, Shiga. This stage is a lot larger than the stage on their float. “Momiji-gari” (紅葉狩) or autumn foliage viewing. This is the princess that will transform into a demon. The play is actually a dance, and the main characters have a solo dance. This is Hachiman the guardian god of the samurai. 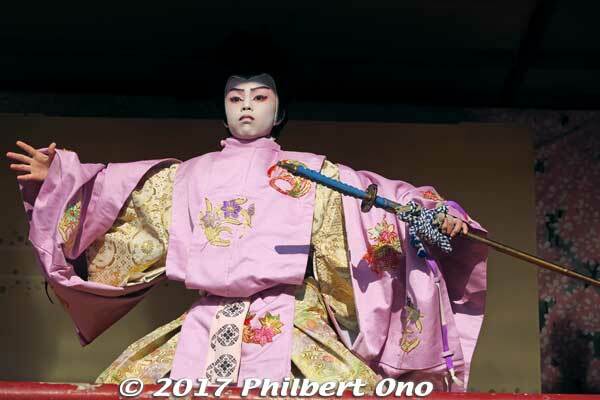 He warns the samurai that the princess is a demon and gives a sword. The samurai who gets drunk by the princess and is attacked by the demon. The demon. Don’t you love the makeup? The demon dramatically twirls her long hair. 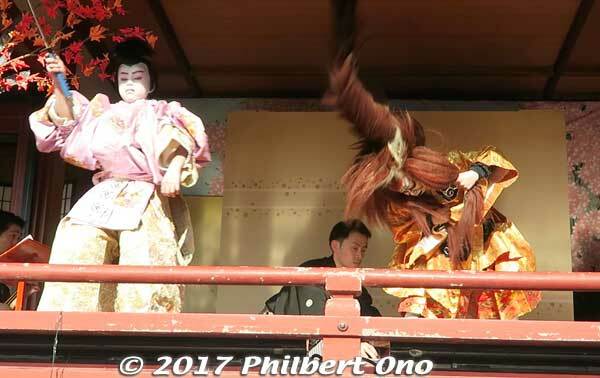 Similar to the Kagamijishi lion dance in kabuki. I was amazed at how they kept their cool in their thick costume amid the hot/humid weather. 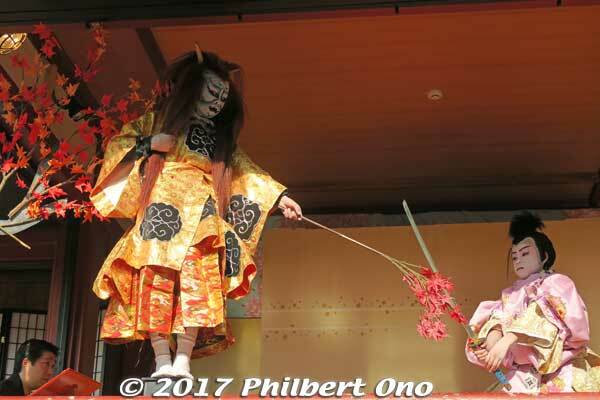 The samurai (on the right) uses the sword given to him by Hachiman to kill the demon. How dramatic. I enjoyed this play. Bravo to all the performers and people who put on this event. I’m not really a stamp collector, but the Japan Post Office issues so many commemorative stamps and it’s such a major hobby that it’s hard to ignore. Of course, stamps are a great way to promote whatever it promotes. Assuming that you still send paper letters or postcards in this electronic age of email and messaging. They are also great as souvenirs or gifts (very lightweight). 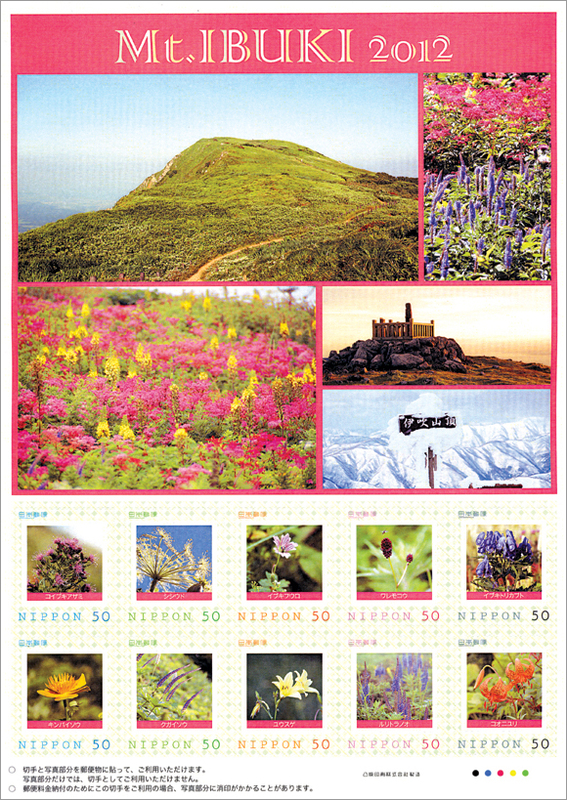 If you go to your local post office in Shiga, you will likely see Shiga-related stamps and postcards on sale (available only in Shiga). They are sold for a limited time, but most of them become available later by private stamp dealers online (auctions, etc.). New editions are also issued every year or season. Here are a few of the Shiga-related stamps that were issued in the past. 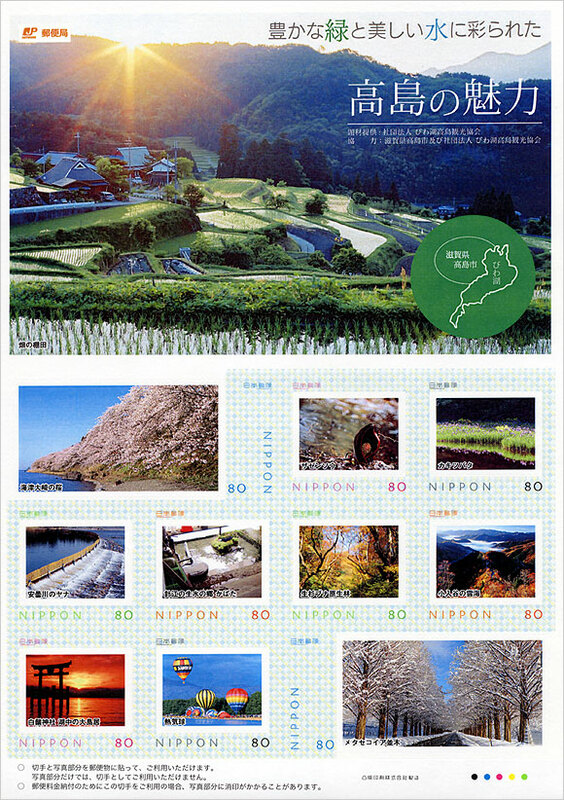 Stamp sheet of Shiga sights issued in 2009. 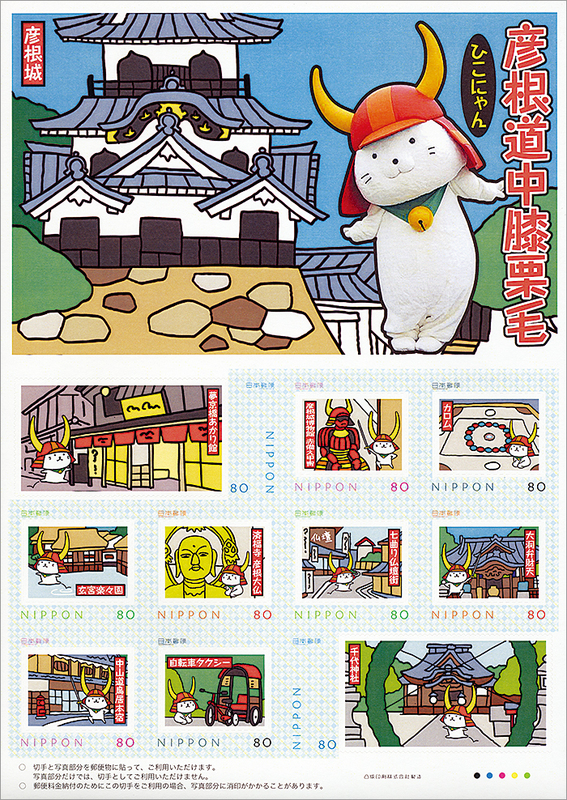 Hiko-nyan stamp sheet issued in 2013. Came with a hand towel. 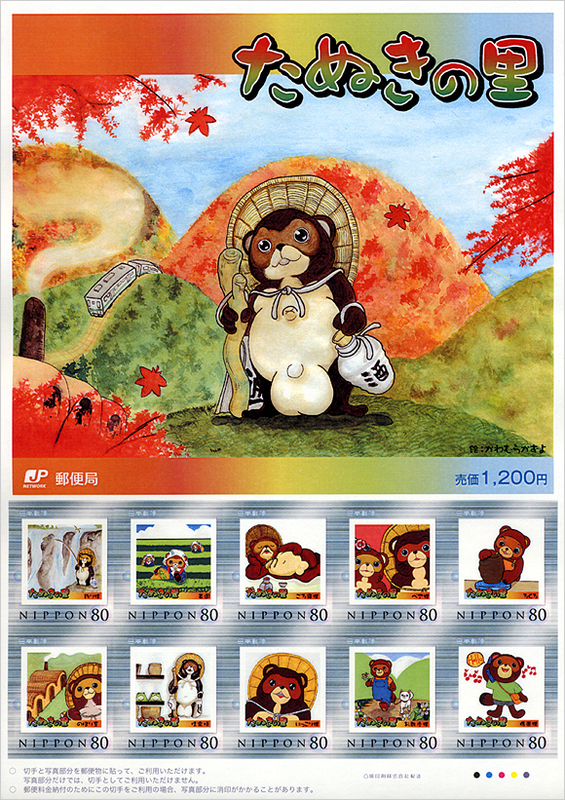 Shigaraki tanuki stamp sheet issued in 2008. Mt. Ibuki summer flowers issued in 2012. Similar sheet is issued annually. 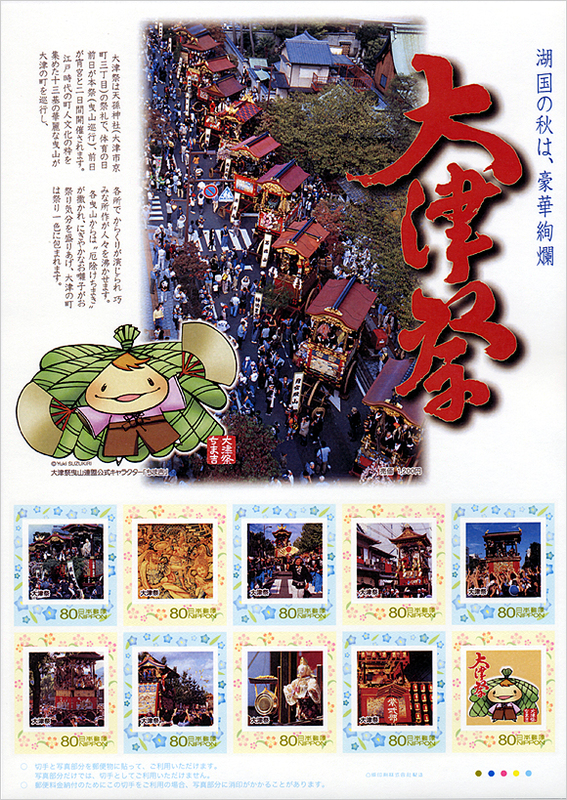 Otsu Matsuri stamp sheet issued in 2008. Takashima sights issued in 2009. 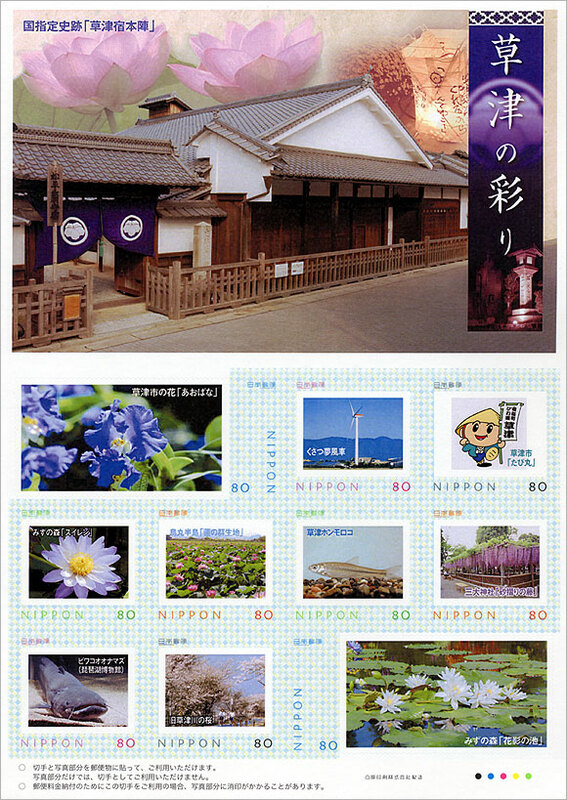 “Colors of Kusatsu” stamp sheet issued in 2009. 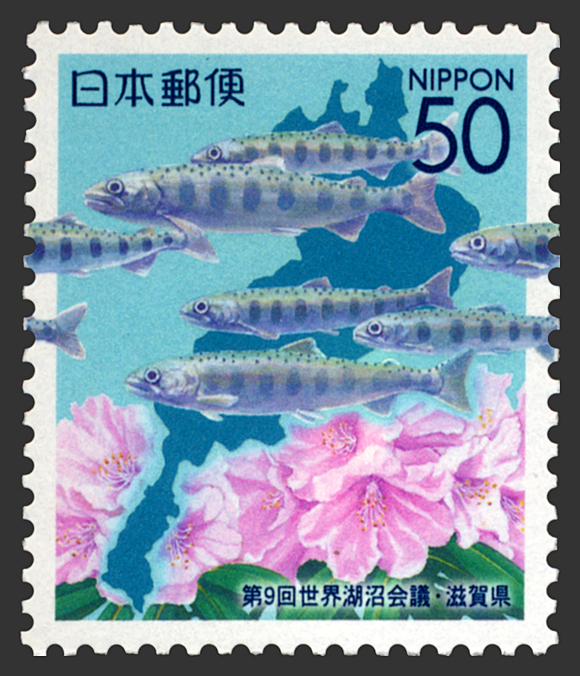 Commemorating the 9th World Lake Conference in 2001 in Otsu, Biwa masu salmon endemic to Lake Biwa. 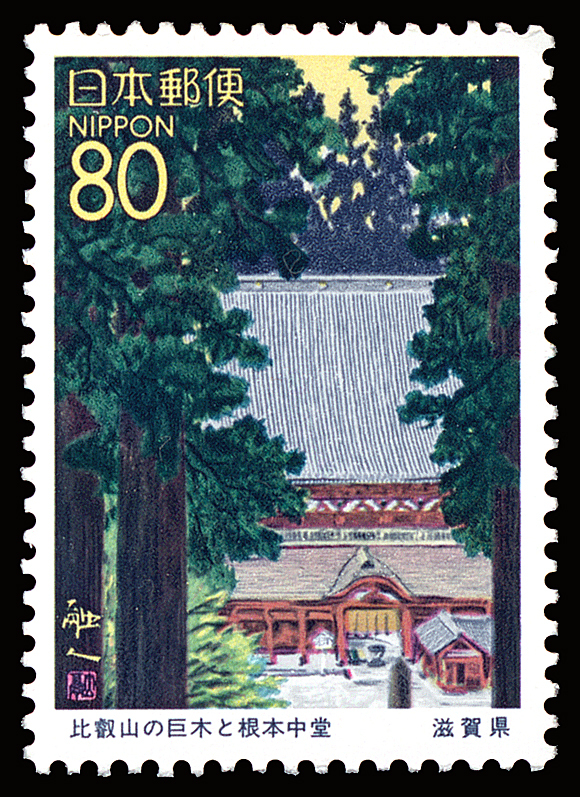 Enryakuji temple stamp issued in 1996 (Konpon Chudo main hall). 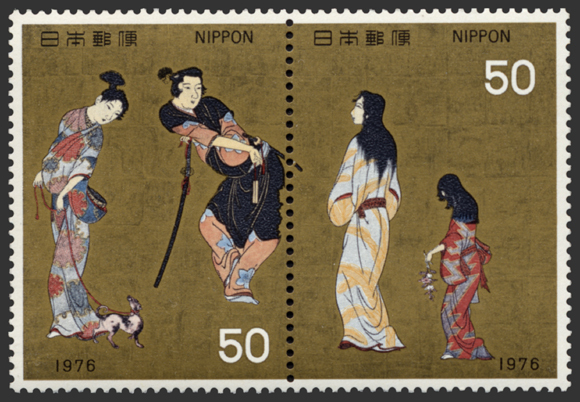 Hikone Byobu folding screen (National Treasure) stamps issued in 1976. 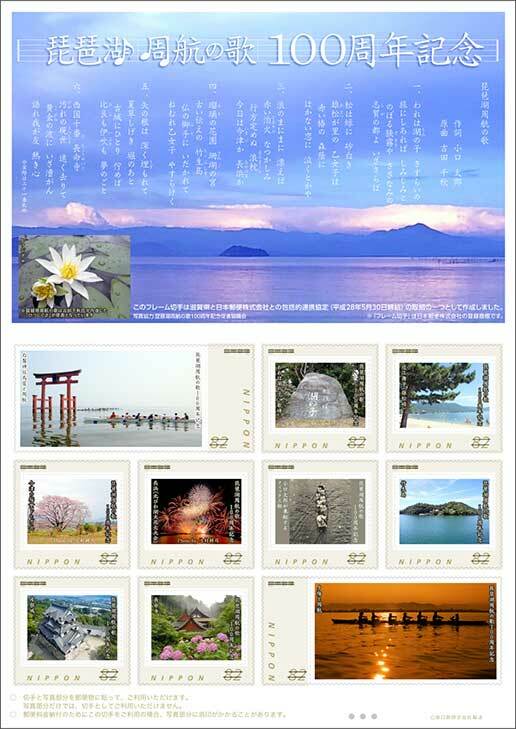 Stamp sheet commemorating the 100th anniversary of Biwako Shuko no Uta (Lake Biwa Rowing Song) in June 2017. Also read about Shiga’s die-cut postcards here.